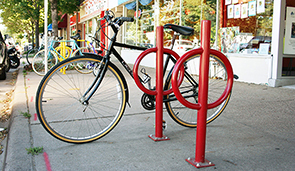 Bollard style bike rack designs help create a greater sense of public space by providing cyclists a secure fixture for bike parking that also limits access to select areas. The dual purpose Bicycle Hitch bike rack is strong, secure and confident. 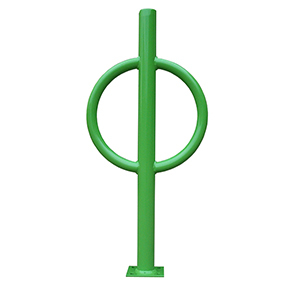 Developed with commercial grade steel, the bold center post is constructed with 2.375" O.D. schedule 40 piping and a 1-1/2" O.D. steel tube hitch ring. By combining a slim design, durable materials and high quality finish, this bike rack is able to withstand tough seasonal conditions. Accommodating all types of bicycle locks, the Bicycle Hitch is able to be used independently or grouped together, creating a safe, sleek aesthetic around facilities.